UDI U818A Drone Review 2019 – is the UDI U818A quadcopter worth the money? Review of features, pricing, flight duration, battery, camera and more. UDI has had a good history of releasing toy drones with pretty good aesthetics that set its products apart from the rest of the brands on the market. Despite releasing the new brands such as the U32 and the U28, the company is still known for its older U818A released in 2014. Since its debut in the market, the U818A has continued to make a name for the company in the drones market. It is recognized as one of the toughest toy drones to have been manufactured with pretty great features. Perhaps this is the reason this brand is still popular among many online stores and buyers alike. It was built to withstand all manner of abuse, has excellent flight and costs less than $100. Because of its highly integrated prop guards, the U818A is safer to fly compared to other drones. This drone is an improvement of the older versions with a HD 720P camera. • It is of a large size that measures 15x15x7.5 inches with pretty powerful motors to guarantee a stable flight. • Has an HD camera with a wide-angle lens with minimum jello effect and good stabilization. • It has FPV mode—you can install the Flyingsee app to enable you to fly it in FPV mode. • It has a micro SD with up to 4GB capacity of external storage. • It has fewer pixels. Although the price is better for the quality of the drone, a better sensor wouldn’t have hurt. Despite its prop guards, the U818A is an easy-to-pilot drone thanks to its reasonable stability while airborne. The drone can has 360 degrees capability, tilt and can do a 3D flip. Its propeller guards make the drone have a hard time flying in a windy environment. However, you can remove the prop guards and its body shell to make it lighter and faster. This will also increase its flight times a great deal. It comes with LED searchlight which can be turned on when the headless flight mode is turned off. If you turn on the headless mode will make the LED lights to turn off automatically. At first, the U818A came with a low-resolution camera, but the company has since upgraded the camera to a better HD 720P that gives 1280×720 resolution videos and pictures. 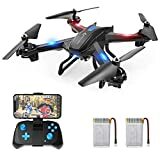 This makes the camera have a field day when competing with other toy drones in the same price range. UDI U818a and Syma X5C are certainly some of the best performing quadcopters on the market today thanks to their prices. 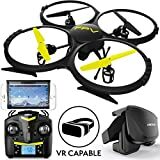 The drones come under the list of under $100 category. As the bestselling RC drones, the UDI U81A and the Syma X5C have multiple applications and feature smashing features. When you compare the two drones, you come to realize that these drones have completely revolutionized the drone industry. The two introduces us to the evolving roles of drones in real life. 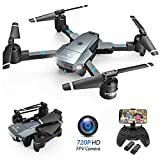 Although the two drones come in the quadcopters in the category of the low budget, they have features very drone enthusiast can die for, including its adaptable onboard camera, which distinguishes the two on Amazon. Both drones have a powerful camera that gives them the edge over the helicopters in the higher price range. Both drones feature plastic exteriors, which have proven to be hard and safe to withstand any abuse and which have the ability to withstand crashes. The UDI U818A is known for its capability to stand the odds of outdoor flying, including its ability to move through strong winds and handle the impact from obstacles. Their rotors are well safeguarded in circular rings which provide the much-needed safety when flying in unsafe conditions but which also gives it great looks. However, the Syma X5C is lighter than the UDI U81A, which makes it a great option for indoor flying. This means that UDI U81A outperforms the Syma X5C when it comes to outdoor flying as it offers a stable outdoor flight even in windy conditions. On the other hand, the Syma x5c has quite a perfect look thanks to its all-white exteriors and powerful dual LED lights. Its sleek design helps to keep it safe when flying in obstacles. However, it is advisable to get extra propellers as the model is susceptible to damage owing to its white exteriors. When you comparing the two drones, both are relatively stable owing to the 6-axis gyro fitted on both machines. Additionally, they come with a four 2.4 GHz 4 channel remote control. Both of the models have the 360 degrees flip capability during the flight mode, a feature that distinguishes them as the most stable drones. They also have the 3D flight capability while its six-axis gyro system offers the balance needed during flight. This means that little or no external input is needed, hence easy remote operation. What’s more, both UDI U81A and the Syma X5C have great maneuvering ability and their unique flight is something to only watch but also envy. As far as flight time is concerned, UDI U818A performs magically better than the Syma X5C, giving a 15-minute flight compared to the Syma which delivers a 7 minute flight time. However, the U818A battery takes about 3 hours to charge compared to Syma X5C with takes just under an hour to attain a full charge. 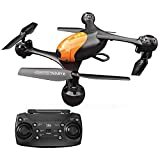 This is a pretty cool and sleek toy drone that performs quite well compared to other drones in the same price range. I have never owned or bought a drone before, but having purchased this drone makes me feel good about the decision. However, what worries me is that I cannot use a different battery owing to its proprietary battery slot. The UDI U818A may have been released a few years ago but it still gives owners value for their money. Although it doesn’t feature the most advanced altitude hold and auto take-off and landing features, its basic features are still pretty good for most people, especially for users who prefer using manual settings. It is a strong drone that can endure poor handling, which makes it an excellent drone for both children and adults. Its upgraded HD camera that comes with 720P gives it the competitive advantage in the category of under $100 drones. Although newer models of drones such as the Syma X5HW and the JXD 509G have been released, the UDI 818A Drone gives these new drones a run for their power and speed.